I remember those days oh so well with my children and also when I was little! I still have quite a few tucked away in a scrapbook. The time truly does fly! Our youngest is 37 and has five kids of her own. It seems just like yesterday we were driving her to cheer leading practice! Oh yes...I subscribed to your feed for you too! I hope you can visit me back! What a great idea-the cards look good! Great Valentine's cards!! We're not that adventurous....we got store bought ones. I love home made Valentines! They just mean so much more! 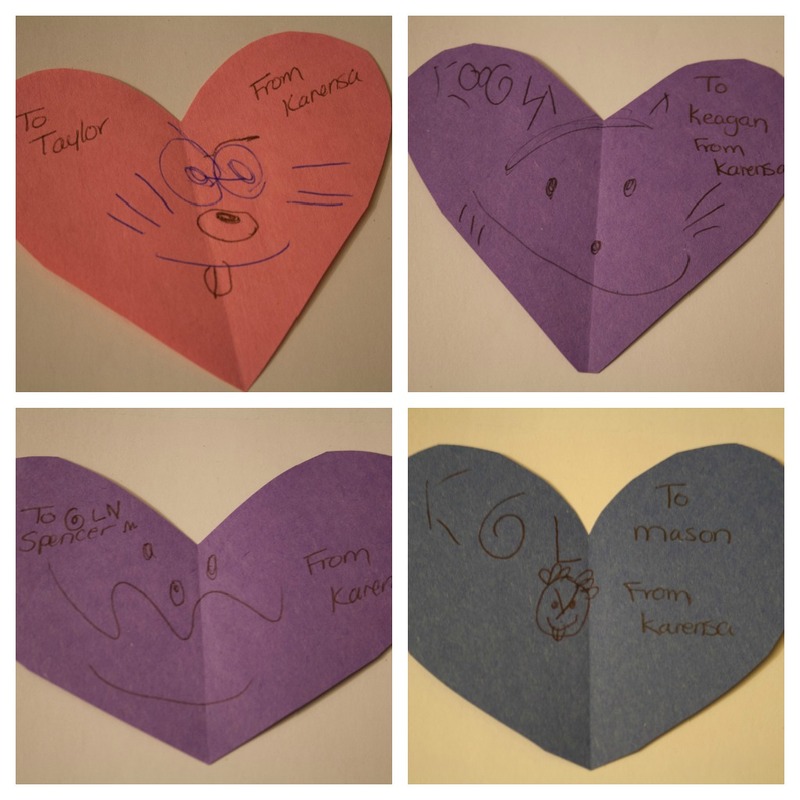 Very creative and thoughtful to make your own Valentines! Much more special than the store-bought ones!!! So simple but so sweet. Love it! I think the kids did such a great job! Those are great. Valentines is so fun! so sweet. I love when kids put faces on inanimate objects like that. so cute! I love homemade Valentine's Cards! So cute! Awww. I love homemade Valentines! So sweet! Ahh the days of paper, scissors and crayons they were a happy time at home with four. We used to make the valentine boxes to catch the Valentines at school. Thanks for hosting, hope you can visit. Happy Valentines!! My grandkid and I didn't make Valentines Day cards this year. We made store bought ones. Or I should say we bought Valentines Day cards at Walgreens but I'm looking forward to spending time with her to see all the ones from her classroom. Those are really cute! My daughter will be working on finishing her Valentine's when she gets home from school. The kids did very well! Happy Valentine's Day to you and your family. Reminds me of the cards my children used to make me.. So cute! I bet they had fun, too! So creative! Love crafts. My son likes to draw but not make crafts with me. I love them! Handmade are always great! We did handmade cards too! You know it's crazy when Pinterest seems easier than a Target run. Handmade Valentine's are the best! Making homemade / personalized valentine cards or any cards are the best to give and get.